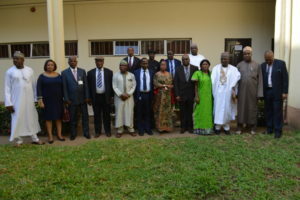 The Chairman of the Independent Corrupt Practices and Other Related Offences Commission (ICPC) Professor Bolaji Owasanoye has declared the Commission’s willingness to collaborate with the National Hospital Abuja and other stakeholders to achieve an improved health care delivery in Nigeria. Prof. Owasanoye made this declaration when he received the Governing Board and Council of the hospital at the Commission’s headquarters recently. The ICPC Boss said that corruption which he described as “an existential issue” for Nigeria was the key reason things donot work well in almost all the sectors of the nation. He stressed thatdealing with the issue of corruption was not always an easy task, but that the nation would make meaningful progress when government agencies work in synergy by taking preventive measures against corruption, which is cheaper. Earlier in her address, the Chairman of the board of NHA, Rt. Hon. Patricia Ette,who spoke on behalf of the team, felicitated with Owasanoye and the board on their appointments while applauding the work of the Commission in curbing corruption. She added that her team was in the Commission to express their interest in working with ICPC to give Nigerians the best that they deserve especially in terms of healthcare delivery. “We appreciate what you are doing and want to identify with the cause”, She said.